Center City District Restaurant Week, presented by Maker’s Mark Bourbon and El Tesoro Tequila and supported by OpenTable and Lyft, is more popular than ever and is returning in January for nearly two weeks! From January 13-25, 2019, more than 115 participating restaurants will serve three-course dinners for $35 per person and three-course lunches for $20 per person (excludes tax, gratuity and alcohol). New restaurants for this season include Bai Wei, Sedition, Mission Taqueria, Giuseppe & Sons, and Fat Salmon. 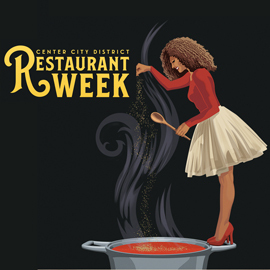 Visit CCDRestaurantWeek.com to see the full list of participating restaurants and links to make reservations via OpenTable, and enter for a chance to win a grand prize of dinner once a week for a year at select Center City restaurants and a $500 TD Visa® gift card valid at any shopping location. Follow @PhilaRestWeek on Twitter and Instagram for the latest updates. All menus will be posted in the coming weeks. Center City District has partnered with 6abc to bring City Hall to life with the sights and sounds of the holiday season. Showcased nightly, the festive Deck the Hall Light Show presented by Independence Blue Cross, synchronized to your favorite holiday music, is projected on the west façade of Philadelphia’s historic City Hall now through January 1, 2019. 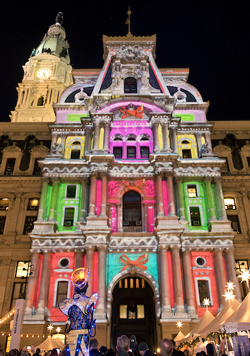 This magnificent light show, viewed from Dilworth Park is sure to make your holidays bright. Follow @CCDParks on Twitter and Instagram for the latest information and use #DeckTheHall to the join the fun. For more information about the Deck the Hall Light Show presented by Independence Blue Cross, visit DilworthPark.org. 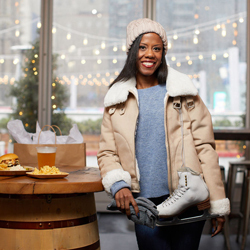 Skate, stroll, shop, eat and drink- wintertime activities continue at Dilworth Park. The Made in Philadelphia Holiday Market, sponsored by B101.1, is a unique holiday shopping experience with gifts sure to please. Local artisans, designers, crafters and confectionaries offer a unique selection of gifts and special foods in festively lit tents topped with authentic Herrnhut stars. The Holiday Market is open now through January 1, 2019 with special hours for the holidays: 11AM – 5PM on Christmas Eve and closed on Christmas Day. New for 2019, the Rothman Orthopaedics Ice Rink will offer skating lessons for children and adults and throughout January and February, the Rothman Rink will be accessible for everyone again with Sled Skating, sponsored by Magee Rehabilitation Hospital. Email sleds@rinkmanagement.com to reserve a sled and visit DilworthPark.org for information about skating lessons.